The U.S. drugmaker says it won’t go hostile for AstraZeneca, but has upped its non-binding takeover proposal to $117 bln, declared it “final” and slammed the board. The UK group is under real pressure to show it’s worth more. Yet Pfizer’s aggression is also an obstacle to talks. The ticker symbol for AstraZeneca is displayed next to a ticker for Pfizer on the floor of the New York Stock Exchange April 28, 2014. Calculator: Where should AstraZeneca shares be trading? U.S. drugmaker Pfizer said on May 18 it had raised its offer for British rival AstraZeneca to 69.3 billion pounds (117 billion), or 55 pounds a share, and would walk away if AstraZeneca did not accept it. 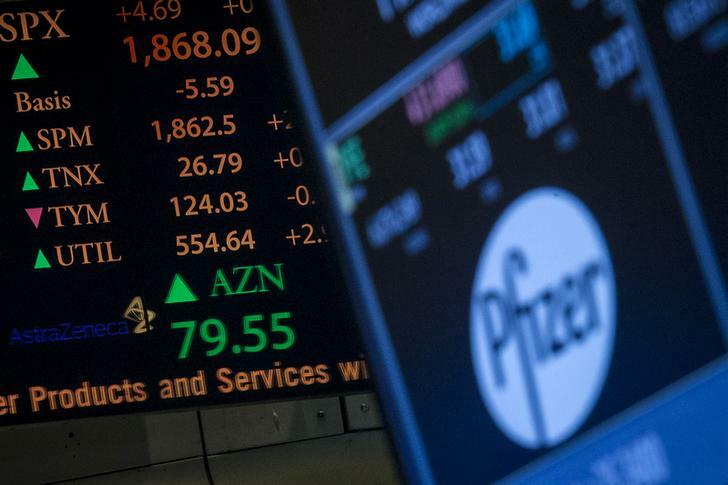 Pfizer also increased the cash element in its offer to 45 percent, with AstraZeneca shareholders set to receive 1.747 shares in the enlarged company for each of their AstraZeneca shares and 24.76 pounds in cash. The new offer represents a 15 percent premium over the current value of a cash-and-share approach made on May 2 – worth 50 pounds a share at the time – which was swiftly rejected by AstraZeneca. Pfizer also revealed it had written to AstraZeneca’s chairman on May 16 offering 5.50 pounds a share – 40 percent in cash – but had been told that this still substantially undervalued the company. “We believe our proposal is compelling for AstraZeneca’s shareholders and that a Pfizer-AstraZeneca combination is in the best interests of all stakeholders,” Pfizer Chief Executive Ian Read said in a statement.